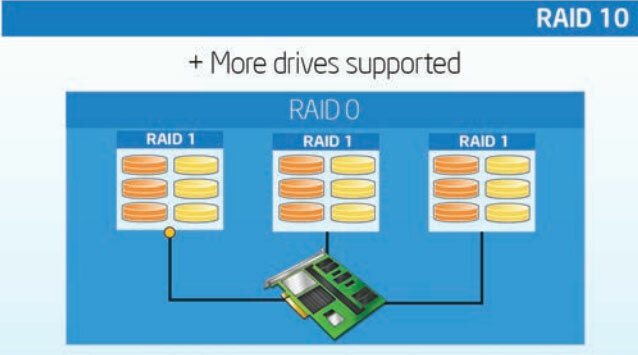 RAID stands for a Redundant Array of Independent Drives (or disks). 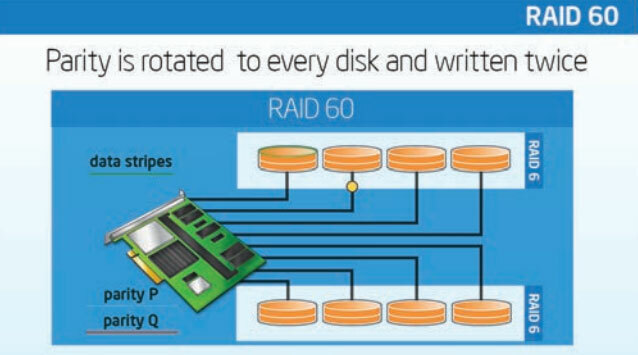 RAID gathers individual disk drives into a cohesive drive set. Often called RAID groups or Raid Arrays that can be operated in unison. RAID also offers other benefits. The first is that higher levels of data protection can be achieved as redundancy is accomplished through mirroring. Where the contents of one drive is duplicated on another drive. 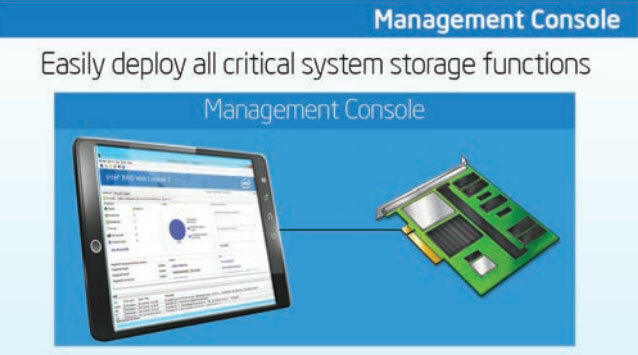 Also drive capacity is aggregated therefore larger storage volumes can be created. Another key benefit is performance, this is realized through disk striping in which the contents of a file are written to and read from across several drives in the RAID Group. Over the years RAID variations have been identified by their RAID level, there are multiple levels of RAID and at each level. There are specific costs, performance and fault tolerance benefits. The level of RAID itself is designated by a number and it’s important to note that this numbering system is not intuitive and does not indicate which RAID level is better so it really goes back to understanding which RAID level will work best for your customer’s environment. Let’s look closer at some of these RAID levels. RAID Level 0 is simply striping. 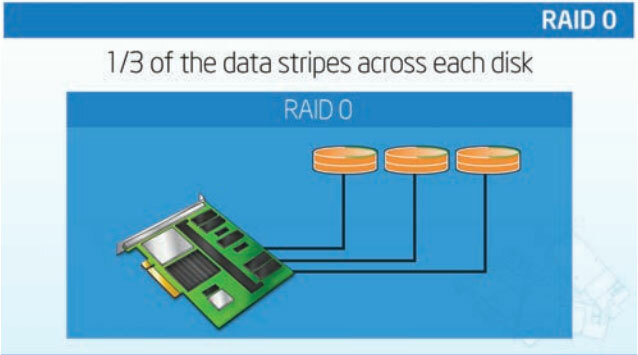 This does not mean that this RAID level is not used, in fact this RAID level is used with many applications in which performance and not data redundancy is important to your customer, but remember, if one drive fails the entire array fails because part of the data is missing with no way to recover it other than restoring from a back up. Disk striping enhances performance because multiple drives are accessed simultaneously, but remember disk striping does not provide data redundancy. It is recommended that you keep stripe sizes the same across RAID arrays. For example in a 3 disk system using only disk striping, Segment 1 is written to Disk 1, Segment 2 is written to Disk 2 and so on. Data transfer rates will be three times faster than a single disk or JBOD because no redundancy is required and all the reads and writes can be handled simultaneously from each disk. With Mirroring used in RAID 1 data written to one disk is simultaneously written to another if one fails the contents of the other can be used to run the system and reconstruct the failed disk. The primary advantage of disk mirroring is that it provides 100% data redundancy but it is expensive because each drive in the system must be duplicated. Because the contents of the disk are completely written to a second, it does not matter if one of them fails. Both drives contain the same data at all times and either drive can act as the operational drive. 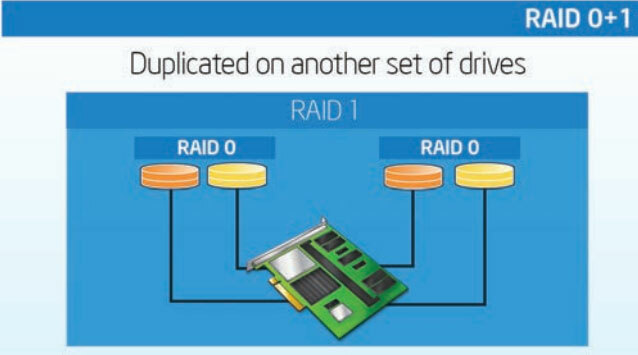 This RAID 1 Illustration shows data being written to two drives at the same time creating an exact duplicate or mirrored data. If a drive fails the controller switches the mirror drive with no lapse in user acceptability. 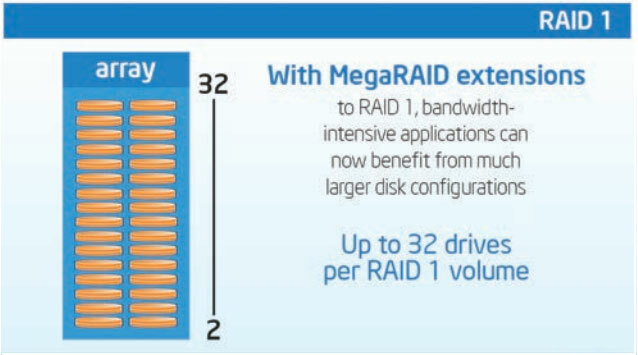 One advantage of the LSI* MegaRAID RAID 1 algorithms utilized by Intel® RAID is a technology called tier reads. During heavy read loads the controller will load balance the read request between both mirrored drives enhancing overall read performance. Traditional RAID 1 allows configuration of only two hard drives and RAID 10 configurations of up to 16 drives. RAID 5 consists of block level striping and parity data distributed across all of RAID member disks. This gives more balanced access load across the drives. The array capacity is the sum of all the disks minus one with a minimum of three drives required. The parity information is used to recover data. If one drive fails so only one disk in an array is used to achieve data redundancy. This is the main reason this method is the most popular, also read performance in a RAID 5 configuration is virtually as good as RAID 0. The disadvantage however is a relatively slow write cycle, 2 reads and 2 writes are required for each block written (one read and write for data block and another for the parity block). This RAID 5 illustration includes 6 physical disks where 5 data blocks are written on 5 physical disks, then parity data is written on the sixth disk. Parity is rotated and eventually written to every disk enabling the controller to recreate lost data onto a replacement disk without system interruption. 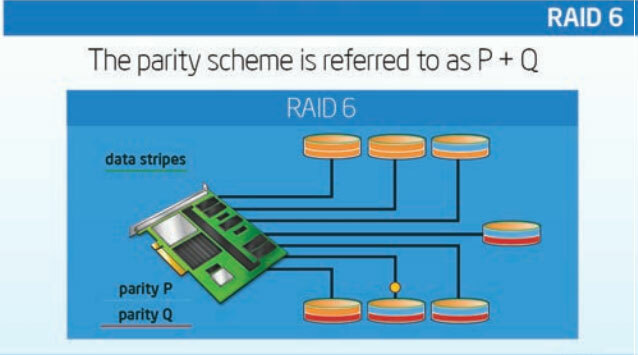 In a RAID 6 configuration, multiple parity operations are spread across the disk group. Which can survive the loss of two drives or the loss of a drive while another disk is being rebuilt. Of all of the standard RAID levels, RAID 6 provides the highest level of protection against drive failures. Read performance is similar to that of RAID 5, there is a performance penalty on write operations due to the over head association with the additional parity calculations. Performance is also further reduced during a drive rebuild. It is not well suited to tasks requiring a lot of writes or environments with few drives. Remember two complete disk failures in a single array is uncommon, an occasional bad blocks vary in frequency but the chance increases proportionally to capacity and number of disk drives. Some calculations show that arrays using the largest capacity disk drives are vulnerable to media errors and up to 1 in 4 rebuilds. In this illustration, Parity P+Q is rotated to every disk and written twice. The term P+Q indicates 2 algorithms are in use enabling the controller to recreate lost data from multiple disk failures on to replacement disks without system interruption. 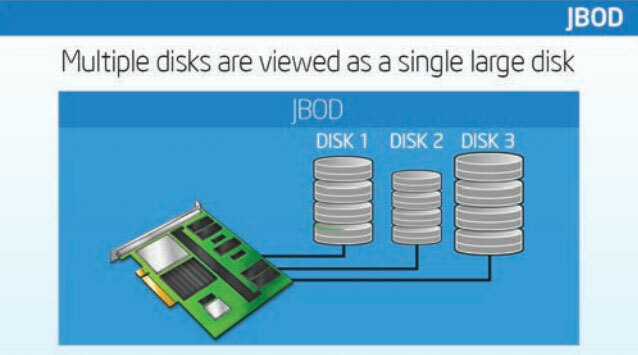 Disk spanning allows multiple physical disk arrays to function like one big drive. Spanning alone does not provide reliability or performance enhancements. So it offers some performance improvements by striping but capacity is low since the mirror requires a duplicate set of drives. 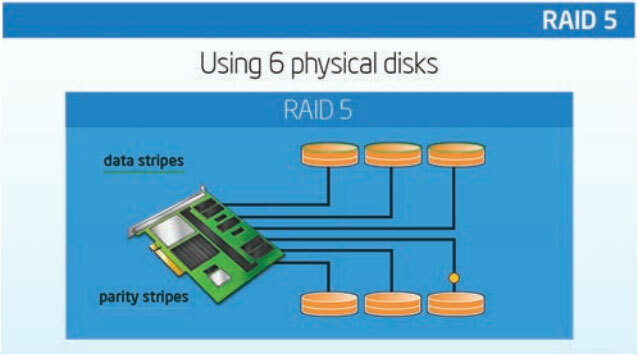 Current RAID controllers support up to 8 mirror groups in a RAID 10 configuration also note that spanned virtual disks must have the same stripe size and must be contiguous. In RAID 0+1 data is striped across multiple drives and mirrored to a duplicate set of drives. RAID 0+1 is similar to RAID 10 with the exception that it cannot tolerate two simultaneous disk failures unless the second failed drive is from the same stripe as the first, that is once a single drive fails each of the disks in the other stripe is a single point of failure. Also, once the single failed drive is replaced all the disks in the array must participate in the rebuild. This Illustration of RAID 0+1 shows two groups of striped disks that are mirrors for redundancy. 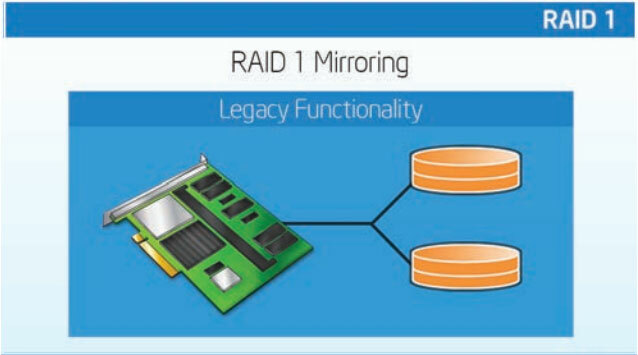 RAID 1E is also a combination of mirroring with data striping. This RAID level stripes data and copies of the data across all the drives in the array. The first set of stripes are the data and the second set of stripes are mirrors of the first data stripe contained within the next logical drive. As with the standard RAID 1, the data is mirrored so the capacity of the logical drive is 50% of the total physical drive capacity of the array. RAID 1E requires a minimum of 3 drives. 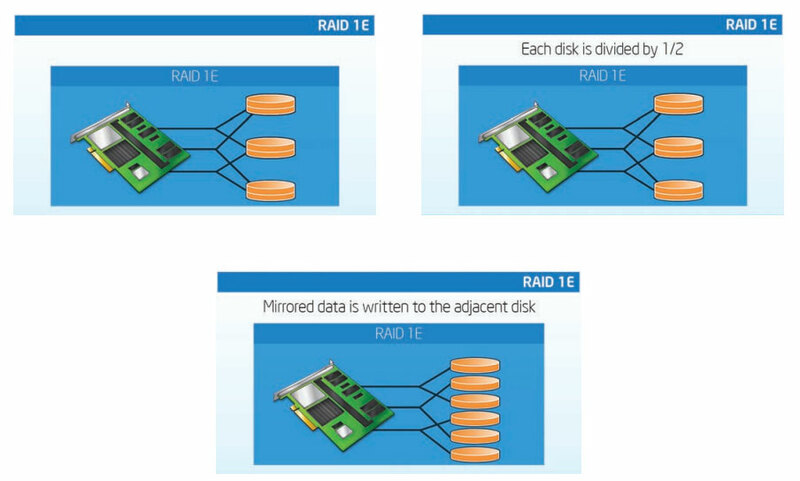 The following illustration is an example of a RAID 1E logical drive, each disk gets logically divided in half and mirrored data is written to the adjacent disk. 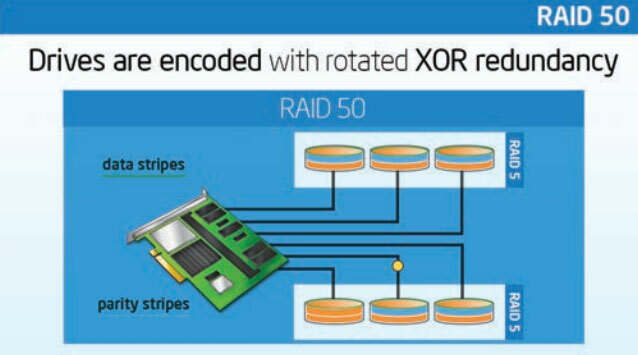 Another example of RAID spanning is RAID 50, like RAID 10 data is striped across multiple drive groups. However Raid 50 provides features of both RAID 0 and RAID 5. RAID 50 provides high throughput, redundancy and performance but required twice as many parity drives as a single RAID 5, configure RAID 50 by spanning two continuous RAID 5 virtual disks. As with RAID 10 the RAID 5 virtual disks must have the same stripe size. RAID 50 is commonly used in large disk groups. As the number of drives in a RAID set increases fault recovery time or the interval for rebuilding the RAID set increases. 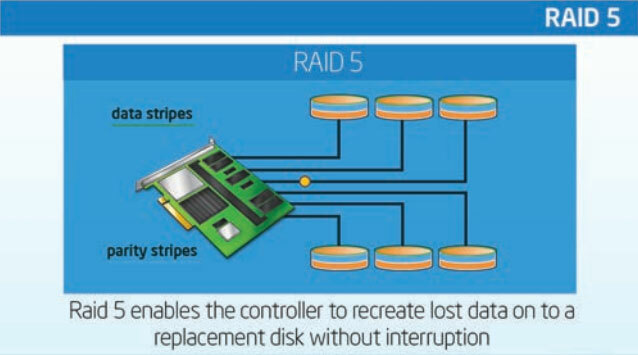 Instead of configuring one large RAID 5 array users can span multiple, smaller RAID 5 groups. The main advantage here is to reduce rebuild times thus reducing the likelihood of another disk failure while an array is in a degraded mode Also RAID 50 improves on the performance of RAID 5 particularly during writes. This level is recommended for applications that require high fault tolerance, capacity and random I/O activity performance. As you can see in this RAID 50 Illustration data is striped across multiple drive groups, data redundancy is achieved via rotated parity data. RAID 60 combines data striping of RAID 0 with a distributed double parity of RAID 6, that is a RAID 0 array striped across RAID 6 elements. 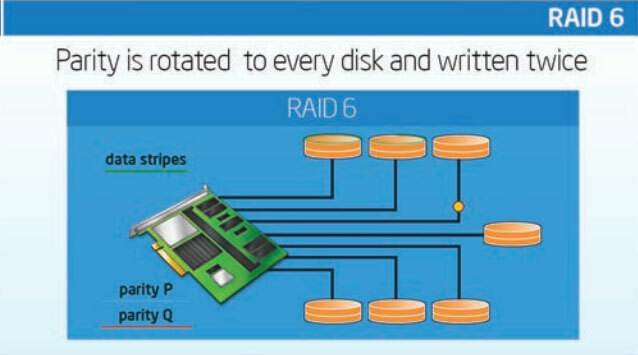 It typically requires at least 6 to 8 disks, RAID 60 has improved fault tolerance, as any 2 disk sets of each the RAID 6 sets can fail without data loss. Also drive failures or unrecoverable media errors occurring while a single disk is rebuilding in one RAID 6 set will not lead to data loss. Striping helps to increase capacity and performance without adding disks to each. RAID 6 set which would decrease data availability and could impact performance. RAID 60 improves upon the performance of RAID 6. Despite the fact that RAID 60 is slightly slower than RAID 50 in terms of writes, due to the added overhead of more parity calculations when data security is concerned this performance drop may be negligible. Concatenation or spanning of disks is not one of the numbered RAID levels but it is a popular method for combining multiple physical disk drives into a single virtual disk. It provides no data redundancy as the name implies disks are merely concatenated together so they appear to be a single large disk. This mode is sometimes called JBOD or just a bunch of disks. Performance is decreased because drives cannot be used concurrently. It is most commonly used when you have odd sized drives that need to be combined into a single virtual disk. 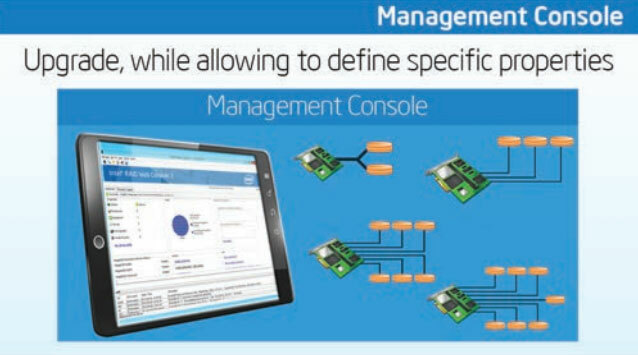 A RAID management console provides a simple way to manage and optimize storage application performance and data protection. It brings critical storage operations and reporting to the administrator’s fingertips, allowing for easy deployment of storage functions. In addition to a Graphical User Interface, a Command Line Management tool also exists to provide additional flexibility, control and scripting capability. It enables administrators to easily deploy all critical system storage functions, including creating and managing virtual drives, adding a drive to a RAID virtual drive and on the fly RAID migration. Upgrading RAID levels is easy through a simple user interface. Depending on the console, it can upgrade to RAID 0, 1, 5, and 6 configurations and associated spans (10, 50 and 60), while allowing end-users to define specific properties for drive READs and WRITEs. Server operations are also allowed and can include creating a virtual drive, load configuration, firmware updating, silence alarm, and unlocking advanced software options, among other things. RAID 0 is the fastest and most efficient but offers no fault tolerance. RAID 1 is ideal for highly fault tolerance environments but requires twice the storage. RAID 5 is the most cost efficient choice for server environments which are not write performance sensitive. RAID 10 is ideal for environments that require 100% redundancy and improved performance and capacity. RAID 50 is ideal for high capacity RAID 5 environments with additional reliability and performance. RAID 1E is a great choice for limited capacity environments such as small databases that need fault tolerance. RAID 6 is the choice for organizations that require high capacity along with high data redundancy where read performance is critical. RAID 60 is great for high capacity RAID 6 environments where additional data protection and performance is desired. Concatenation or JBOD mode is commonly used when combining odd sized drives into a single virtual disk. Intel RAID, or Redundant Array of Inexpensive (Independent) Disks, is a storage technology that combines multiple disk drive components into a logical unit, which helps with data redundancy and improves performance. RAID levels are the different ways data is distributed across the drives and depend on the level of redundancy and performance required.